The Archival Methods Conservation Mat Board uses alpha-cellulose pulp from purified wood fiber, that is more economical to manufacture then cotton paper but has the same stable and long-lasting properties. Purified wood pulp paper has a long history of being safe to use with paper artwork, photographs and documents. Conservation Mat Board is acid- and lignin-free and uses alkaline or neutral sizing. 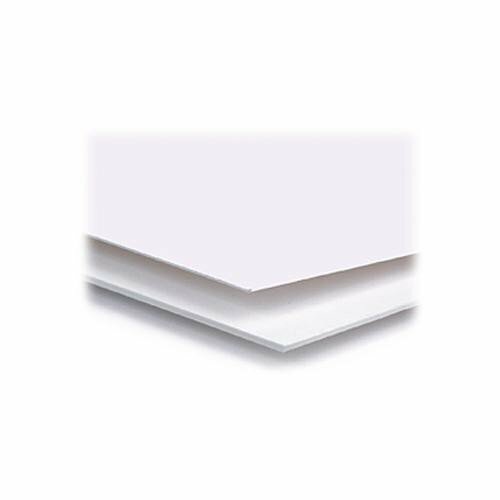 The boards are buffered with calcium carbonate for added protection from ambient conditions that often cause the pH of paper to decrease with age.Pearl White has a warm tonality when compared to the company's' Bright White Museum Board, similar to antique white with less of a yellow tint. The look, feel and cutting characteristics are very similar to mat board made from cotton pulp and has a similar lustrous surface. The boards are buffered with calcium carbonate for added protection and longer life.